From Indonesia we arrived in Singapore on the afternoon of March 19. At the airport we met up with Cecilia, who had arrived there a little earlier from the Philippines. Soon after our arrival, we discovered that a former Singapore prayer group had difficulties sustaining itself. One of the reasons for this was that the prayer group members had absolutely no support from any of the clergy; in fact, they resembled and assembled much like the first crypto-Christians. At This time, on our visit, we saw no one from of this former prayer group at the private meeting that was held with Vassula. Out of all its members, there was only one person who remained very faithful to the Messages; the person who invited Vassula to Singapore. He was trying very hard to re-construct a new prayer group, and keep alive the TLIG messages. This was Lionel, who has known about and has been reading the Messages for many years. He had come to greet Vassula and me at the airport with evident joy, but also with sadness, as he informed us of this news. The next day was Sunday, March 20, Palm Sunday at St. Joseph’s church, which was built in the year 1900 by a Portuguese mission. After Mass, Vassula stumbled upon some members of the old TLIG prayer group. Moreover, Lionel managed to invite a few of the people who had attended the service to come to his house on March 22nd, so as to introduce and in turn speak to them about the importance of the Messages through a video. He then introduced them to Vassula. She talked to them about the beginning of her call, her encounters with her Angel Daniel, the Heavenly Father and the rest. She also talked about the TLIG Ecumenical pilgrimages, encouraging the attendees to join us the next time one takes place. 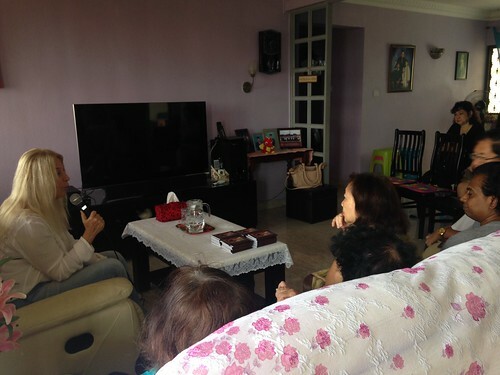 She spoke about the retreats, so as to encourage the people to again have one in Singapore, and of our Beth Myriams, which are a voluntary work of love… Vassula ended her witnessing by reading the prayer that God gave her on February 13, 2016. Before ending this meeting, she warned the group as well that persecutions will always exist; however, they should remain strong, trusting in Jesus. Prayers are always good and they never go in vain, reminding the group that they are not alone as a prayer group in Asia; we have many TLIG prayer groups around the world. The meeting ended with Lionel thanking those who accepted to come and listen. He gave his testimony of how he met Vassula for the first time in Singapore back in 2003. At that meeting, he said, he suddenly saw the Face of Jesus appearing on her face and he was shocked! He immediately rushed out, bought all of the TLIG books that were available and started to read them eagerly, several times, not once, but several times. Since then, Lionel became a witness, searching means for spreading the Messages. We all need to pray that Singapore will be able to keep the TLIG messages alive and that the newly found prayer group remains strong and united. After all, it is a good sign that Lionel has seen Jesus, who showed Himself to Lionel on Vassula’s face. Jesus knew that this man will remain strong and faithful. Vassula thanked Lionel for the warm hospitality and for the TLIG friends who attended this meeting. Above all, she thanked Lionel for remaining faithful to Jesus and for his loyalty to Him.